Ahh, spring. The days get longer, flowers bloom, and gasoline gets more expensive. It’s a galling time for drivers, and it’s more maddening than usual this year. 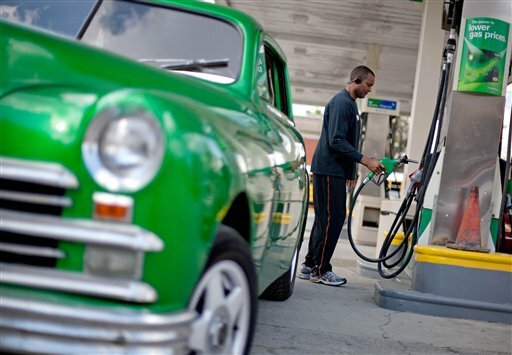 The average price of gasoline could surpass $4 per gallon nationwide as early as this week. It’s already $3.93 per gallon, a record for this time of year. Why the seasonal spike? It’s the time of year refineries reduce output to repair equipment and start making a cleaner, more expensive blend of gasoline for summer. Since 2000, pump prices have risen every year between early February and late May. The annual increase has boosted prices by 27 percent on average, according to the National Association of Convenience Stores. This year, prices have risen 14 percent, or 48 cents per gallon, since Feb. 1. Gasoline was expensive even before the seasonal run-up. Strong global demand, heightened tensions with Iran and a smattering of supply disruptions have kept crude oil prices elevated for months. The oil used to make most of the gasoline in the U.S. has averaged $120 per barrel this year. This year’s spring surge is more extreme than usual because three refineries that serve the East Coast were shut down last fall and another one may be closed in July. That’s threatening supplies in one of the country’s most densely populated regions, and pushing prices higher everywhere. _ Refineries need major maintenance once every four years, on average. On a practical level, that means one-fourth of the nation’s refining capacity is temporarily shut down in the first quarter of every year. Because the U.S. has half the number of refineries it did in 1980, a delay in getting one or two back up and running has a greater impact than in the past. _ To comply with the Clean Air Act and limit smog, refiners have to make a special blend of gasoline that doesn’t easily evaporate in the warm summer air. The fuel is 5 to 15 cents a gallon more expensive to make because of raw material costs. _ The nationwide fuel supply can’t be transformed overnight. Between April 1, when refiners must start making the summer blend, and June 1, when retailers have to be selling it, supplies become uncertain, and prices at the pump rise. During this period when refiners are doing maintenance and making summer gasoline, the odds of an unexpected supply disruption rise, analysts say. To protect themselves against this possibility, energy traders buy wholesale gasoline futures on financial exchanges. That pushes wholesale gasoline prices up. And higher wholesale prices are quickly translated to higher retail prices. Distributors and gas station owners buy gasoline every day based on a price set on exchanges. Station owners then change their prices based on how much their last shipment cost, how much the next shipment is likely to cost and what their closest competitors are charging. Retailers can go back to selling winter blends on September 15. While it’s not required, most do so because it is less expensive. Gasoline prices generally decline in the autumn, along with gasoline demand. Seasonal price swings are not unique to the energy business. Flights to Europe are more expensive in summer, when travel demand rises, and strawberries and tomatoes get more costly in winter because they must be shipped from far-flung places. Yet when it comes to gasoline and spring price hikes, drivers don’t want to hear about supply and demand or higher production costs. Tony Kost of Leesburg, Fla., who commutes 80 miles roundtrip a day for work, says it’s hard to buy the industry’s explanation for the seasonal price spikes. There are some consolations for Kost and other drivers. Even though it may not feel like it, gasoline prices do usually dip after their spring peak. Last year gasoline fell from $3.98 per gallon on May 5 to $3.55 on July 1 and finished the year at $3.28. Also, summer gasoline blends improve fuel economy by 1 percent to 2 percent. That means drivers will at least get to go a little bit farther on that pricey tank of gas.